The terrible tragedy of Charles’ death threw a pall over the Château and the town. Anne was only twenty-one. Already heartbroken having lost seven children to early deaths, she was devastated. 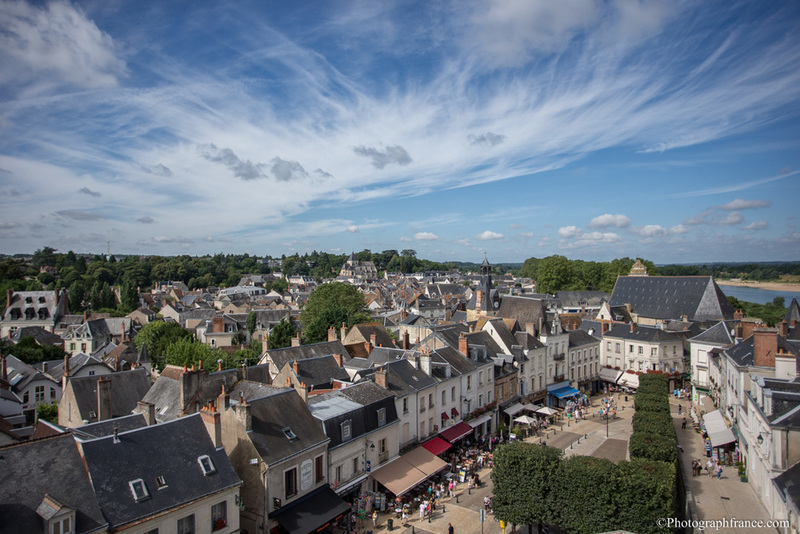 She couldn’t wait to leave Amboise and went home to her beloved Brittany. Alas. When you are high born your destiny is mapped out. She had to go through a second marriage with a cousin of Charles who reigned as Louis XII. It was also Louis’ second marriage. Because France needed Brittany for security reasons his first marriage was annulled so that he could marry Anne. She, understandably, refused to live in Amboise which held too many sad memories for her so she and Louis lived in Château Blois. Not only did Louis marry Charles’ widow, he carried on with the improvements at Château Amboise which Charles had begun. He also carried on Charles’ claim to Naples. Like Charles he became, for a short while, King of Naples. Louis and Anne had four stillborn sons and two daughters. Anne died in 1514. Louis followed her a year later. At her marriage to Charles age 14, Anne was described as a young, rosy-cheeked girl. By the time of her marriage to Louis, aged 22, after seven pregnancies with no surviving children, she was described as pale-faced and wan. By the end of her life, at 36, she had been pregnant 14 times, from which only two children survived. Their elder daughter, Claude, married Louis’ cousin and heir, François of Angoulème. 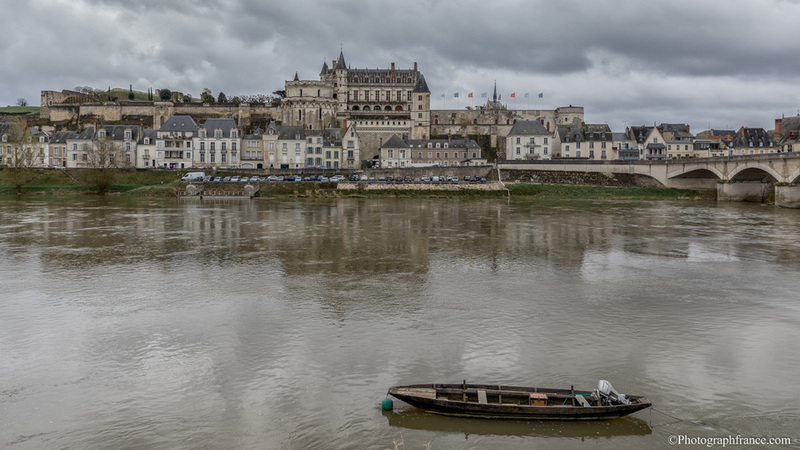 Brought up in Amboise, François retained a lifelong affection for his childhood home. He reigned as François I. A cultured, intelligent, man he spoke Hebrew, Italian, Latin and Spanish. He loved dancing, music, archery, falconry, riding, hunting, jousting and tennis, He studied philosophy and theology and was fascinated with art, literature, poetry and science. Before François, the royal palaces had only a few paintings and no sculptures. France’s magnificent art collection now at the Louvre began with him. Determined to gain a foothold in Italy, François promised Pope Leo X authority over the Catholic Church in France in return for his authority over Naples. Leo’s nephew Lorenzo II de’ Medici married Madeleine de La Tour d’Auvergne, Duchess of Urbino, Countess of Boulogne, a relative of François in Château Amboise. It was a double celebration. His wife Claude, daughter of Anne of Britany and Louis XII, had just given birth to a son named François. Like Charles VIII, François was obsessed with all things Italian. His fascination with the Renaissance meant he was a generous patron of the arts and famously persuaded Leonardo da Vinci to leave Italy and live in Amboise. He refurbished one wing of Château Amboise and decorated the windows in the Italian style. It was from Amboise that François set out to conquer Italy and achieved victory at the Battle of Marignano. He was twenty-one. Ten years later, he was not so successful at the Battle of Pavia and was taken prisoner. His second son Henri II would finally renounce France’s claims on Italy. This was the age of Martin Luther who protested against the teachings and practices of the Roman Catholic Church of Rome. Protestants were called Huguenots in France. François was fairly tolerant of them until the night they managed to access his private apartments in the Château and nailed their grievances to his bedroom door just as Luther had nailed his on the door of his local church. François ordered brutal reprisals be carried out on the Huguenot Leaders but their punishments paled in comparison to what happened in 1560 when his grandson was on the throne. François, like Charles VIII, wanted a palace like Alfonso’s. Instead of spending more time and money tinkering with Château Amboise he built new, grand, Renaissance Châteaux at Chambord and Fontainebleau after which he spent less time in Amboise although it remained an important staging post for royalty. Francois I died in 1547. He was succeeded by his second son Henri II who married Catherine de Medici. It was her parents, Lorenzo II de Medici and Madeleine de La Tour d’ Auvergne, who got married at Château Amboise. It was at the Château their children were raised with Mary Stuart, the child Queen of Scotland. Henri II, like Charles VIII, died before his time in a tragic accident. In 1560, his son King François II was sixteen years old. The previous year he had married Mary Stuart, Queen of Scots. The Protestants, to air their grievances, planned to abduct the young couple from Château Amboise but the plot was foiled. The conspirators were executed in public and their corpses were hanged from the Château walls. The carnage was shocking. An understandable pall fell over the town and the Château fell out of favour with royalty. It was used a prison for a while. A huge part was destroyed by French Revolutionaries in the early 1800s. Louise-Marie-Adelaïde, Duchess of Orleans, great-granddaughter of King Louis XIV (The Sun King) inherited Château Amboise in 1815. She gave it to her son, Louis-Philippe, when he became King in 1830. A cousin of the murdered King Louis XVI he left France in 1793 to escape the Terror and roamed Europe for twenty-one years. His father, who refused to leave France, paid with his life. Louis-Philippe bought and demolished houses built against the castle walls to clear the ramparts and began restoring the Château intending it as a holiday home for his family. His study, bedroom and music room are still there. Louis-Philippe somehow managed to survive seven assassination attempts. It would be romantic to think that the tunnels under the Château (one runs to the writer’s house) were excavated on his order in case more were to come. It was the King’s son, the Duke of Aumale, who led the invasion of Algeria and took its leader, Emir Abdel Kadir prisoner in 1847. The Emir lived in honourable captivity in the Château for four years with his mother, wives, brothers, children, their tutors, caliphs and servants; in total, eighty-eight. Members of his entourage are buried in the gardens of the Chateau. The Emir was personally liberated by Louis Napoleon Bonaparte in 1852 and died in Damascus in 1883. Louis-Philippe fell out of favour with the public when the economy deteriorated. Forced to abdicate following the Revolution of 1848, he lived in exile in England as an honoured guest of Queen Victoria in one of her Grace and Favour homes. Château Amboise was confiscated by the government. Until 1950, a law passed in 1886 banned all heirs of formerly reigning French dynasties from entering France. Heirs of Louis-Philippe were later given back control of Château Amboise and made a major effort to repair it. During the German invasion of WWII, the Château suffered more damage. 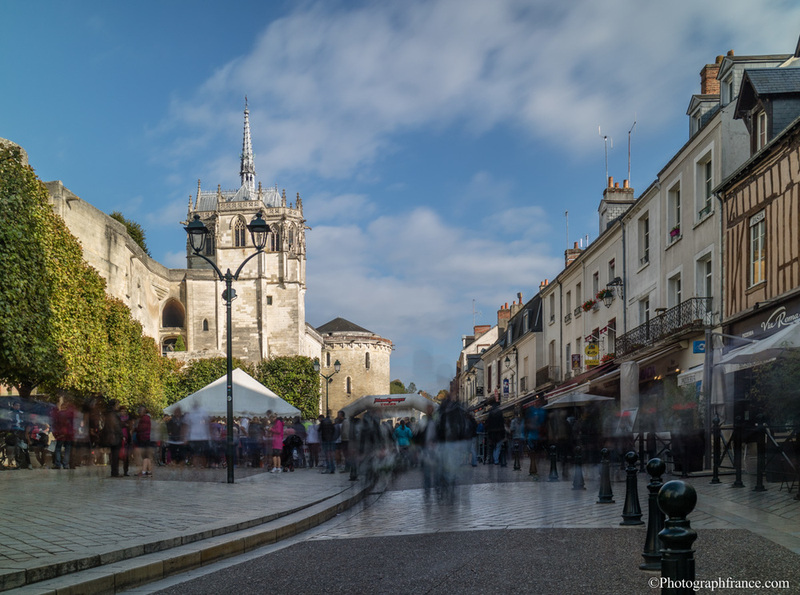 After the fall of Paris, Amboise witnessed a stream of refugees fleeing the enemy and French soldiers retreating. The Red Cross served 50,000 meals a day in Amboise. French Resistance fighters who set up camp in the Château blew up the bridge between the Isle d’Or and the foot of the castle to prevent Germans crossing the Loire. Germans built a pontoon bridge which was replaced by a wooden bridge and a ferry. They set up camp on the island and bombarded the Château. When they managed to cross the Loire, despite the gun battery stationed between the Town Hall and the Loire and fierce resistance, they took the town which suffered severe damage. German troops had also invaded the farm of Girardière and broke the roof tiles to install a machine gun. French soldiers, shot as they crossed the vineyards, are buried in the local cemetery. The Germans occupied the farm and stayed there a few days before entering the Château. They took the remaining Resistance Fighters as POWS. The Château today is just one fifth of how it looked when Charles VIII lived there. It now belongs to the Saint Louis Foundation, presided over by His Grace, the Count of Paris, Henri d’Orleans, a fifth generation descendant of Louis-Philippe, the last King of France (King of the French). He is recognized as the legitimate claimant to the throne by French royalists. Way back in Neolithic times, the mighty rock where Château Amboise now stands was a defensive fort. The natural promontory at the confluence of the Loire to the north and the Amasse to the south, was and is still, a perfect observation point. A town known as Ambacia, the old name for the Amasse, grew up at the foot of the fort. 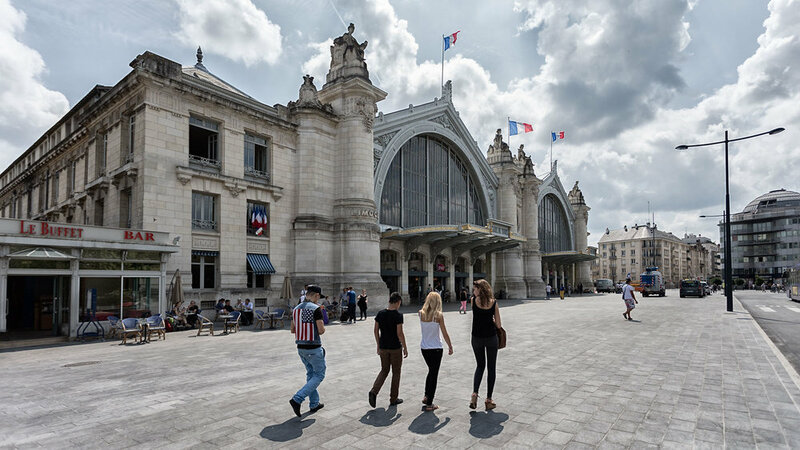 It was inhabited by Turones, a Celtic tribe, who gave their name to the whole area known today as The Touraine. The territory, fought over for many years, ended up with the House of Amboise, one of the oldest families in the French nobility which took its name from the town. The first Lord of Amboise died in 1061. The family Coat of Arms are still on the Arms of Amboise. Charles VII took Château Amboise from the family. He was the first French king to settle in the Loire Valley when his father, Charles VI, known as Charles the Mad, disinherited him in favour of Henry V of England. When Louis XI succeeded his father, Charles VII, he deposited his wife Charlotte of Savoy in Château Amboise but chose to live in a nearby château, Plessis-les-Tours. His son the Dauphin, the future Charles VIII, was born and died in Château Amboise. In those days the entrance to the Château had a drawbridge. It also had an oratory (chapel for private worship) against the inside wall, where Saint Hubert chapel is today. Also inside the walls was the church of Saint Florentin built in the 1100s where Leonardo da Vinci, according to his wishes, was buried. The church was destroyed during the French Revolution. Sixty years later in 1874 when the site was excavated, his skeleton was found with fragments of an inscription containing letters in his name. He was re-interred in the chapel of Saint Hubert. One of Charles’ godfathers at his christening in Château Amboise was Edward, Prince of Wales, the young son of King Henry VI of England and his wife Queen Margaret of Anjou. She was a cousin of Louis XI. Edward and his mother were exiled to France when Henry was deposed by the usurper Edward IV. Charles succeeded to the throne when he was 13. When he was 21 he married the 14 year old Duchess Anne of Brittany. Anne had been promised in marriage to Edward, another Prince of Wales, son of the usurper Edward IV of England. However, soon after the death of Edward IV in 1483 the boy and his brother disappeared from the Tower of London presumed murdered on the orders of the usurper Richard III. Anne and Charles married in Château Langeais in December 1491. The marriage contract stipulated that the spouse who outlived the other would retain possession of Brittany. It also stipulated that if Charles died without male heirs, Anne would marry his successor to ensure the French kings kept Brittany. Anne, unhappy with the arranged marriage, chose to live at the Clos Lucé in Amboise. Her private chapel where she wept many bitter tears over all her dead babies is still there. The Fleur de Lys of the House of Valois and Anne’s Coat of Arms, ermine tails, are in the Château. It was Charles who built the Royal Apartments parallel to the river Loire for the wonderful views. He also built the mighty tower with a ramp so that knights on horseback could get from the town to the Château forty metres above. If, when you think of France, images of elegant Renaissance Châteaux spring to mind, spare a thought for Château Amboise. Although not a Renaissance Château, it still resembles a fortress, it was here the French Renaissance took root when Charles VIII returned from Italy in 1495. The fact he went to Italy at all was something of a fluke. In 1489, to punish Ferdinand, the King of Naples, for refusing to pay his papal dues, the Pope (Innocent VIII) had him deposed and offered Naples to Charles who had a tenuous claim to it via his grandmother Marie of Anjou, and his father Louis XI. Charles did not reach his majority until 1491 so nothing came of it before Pope Innocent died. When Ferdinand died in 1494, his son Alfonso became King of Naples and that might have been that. Charles might never have taken up the Pope’s offer had it not been for Ludovico Sforza, Duke of Milan, the son of a close friend of his father Louis XI. Ludovico, who claimed Milan by the back door by dubious means, was challenged for the dukedom by King Alfonso. In 1493, to see him off, Ludovico urged Charles to take up the late Pope’s offer and claim Naples. Charles was also encouraged by Julius, a pope in waiting. And so it came about that Charles, age twenty-four, invaded Italy in 1494 virtually unopposed. When he took Naples, Alfonso left for Sicily. Charles, King of France, was now also King of Naples. When Charles saw Alfonso’s deserted home, La Poggio Reale (royal hill), he was speechless. In modern parlance, blown away. French art and architecture could not hold a candle to that of Florence, Milan and Naples. Compared with Italy, France was, culturally speaking, backward. Alfonso, a cultured man of impeccable taste, a devotee of the Renaissance, had created a beautiful palazzo. It had arcaded courtyards, shaded avenues, splendid fishponds and fountains, a sunken centre that was flooded for astonishing water spectacles powered by sophisticated hydraulics. One side of the beautiful gardens opened onto a spectacular, uninterrupted, view of Mount Vesuvius. Charles, born into royalty, used to the splendour of Court, born and brought up in Château Amboise, had never seen anything like them. He was so enthralled, he asked the designer, Dom Pacello Mazzarotta da Mercogliano, to return to Amboise with him. Charles had set his heart on an Italian Garden. Dom Pacello designed one for him at the nearby Château Gaillard. When Charles came home, he brought with him eighteen men and two women, gifted in their own fields. Among them were artists, sculptors, architects, carpenters, stained glass workers, potters, stonemasons, a parrot keeper and Europe’s most famous landscape gardener, Dom Pacello. Sadly, Charles, a pleasant young man nicknamed by his subjects Charles the Affable, did not live to see his Italian dream come to fruition. He died tragically, in the true sense of the word, long before his time. He was twenty-eight. Many Royals were tennis fans. Charles was no exception. On his way to see a match at Château Amboise he, as so many of us do, misjudged the height of an arch and struck his head a mighty blow on the lintel. He managed to watch the match but died hours later from a massive brain haemorrhage. Foolish to condense five hundred years of history into one post. However, fools rush in, so here goes. The Renaissance arrived in France via Amboise in 1495 when King Charles VIII, came home from Italy. The fact he went there at all was something of a fluke. In 1489, to punish Ferdinand, the King of Naples, for refusing to pay his papal dues, the Pope (Innocent VIII) had him deposed and offered Naples to Charles who had a slight claim to it via his grandmother and his father. Charles, who inherited the Crown when he was thirteen, did not reach his majority until 1491 so nothing came of it. Then Pope Innocent died. When Ferdinand died in 1494, his son Alfonso became King of Naples and that might have been that. Charles might never have taken up the Pope’s offer had it not been for Ludovico Sforza, Duke of Milan, son of a friend of his father. Ludovico, who had claimed Milan by the back door by dubious means, was challenged for the dukedom by Alfonso so to see him off, Ludovico urged Charles to take up the late Pope’s offer and claim Naples. Charles was also encouraged by pope in waiting, Julius, in order to settle an old score against the incumbent, Pope Alexander VI. When Charles saw Alfonso’s deserted home, La Poggio Reale (royal hill), he was speechless. In modern parlance, blown away. Alfonso, a cultured man of impeccable taste, a devotee of the Renaissance, had created a beautiful palazzo. It had arcaded courtyards, shaded avenues, splendid fishponds and fountains, a sunken centre that was flooded for astonishing water spectacles powered by sophisticated hydraulics. One side of the beautiful gardens opened onto a spectacular, uninterrupted, view of Mount Vesuvius. Charles, born into royalty, used to the splendour of Court, born and brought up in Château Amboise, had never seen anything like them. He was so enthralled, he managed to persuade the garden designer, Dom Pacello Mazzarotta to come home with him. Charles had his heart set on an Italian garden. At that time, French art and architecture could not hold a candle to that of Florence, Milan and Naples. Compared with Italy, France was, culturally speaking, backward. When Charles came home, he brought with him eighteen men and two women, gifted in their own fields. Among them were artists, sculptors, architects, carpenters, stained glass workers, potters, stonemasons, a parrot keeper and Europe’s most famous landscape gardener, forty-two year old Dom Pacello. Pacello, a secular cleric of the Benedictine Order, born in Mercogliano forty miles from Naples was inspired by the great Florentine, Leon Battista Alberti, who formalized the rules of landscaping. As soon as he got home, Charles got to work beautifying Château Amboise. Needing somewhere prestigious to house Europe’s most famous landscape gardener, he rebuilt the nearby, mediaeval, Château Gaillard. 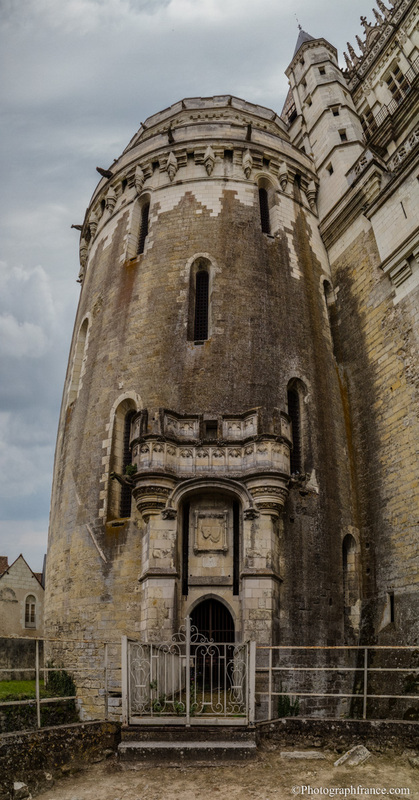 The massive stone spiral staircase serving the three floors of the main building, built to protect the southern entrance of Amboise, is still there. Charles gave Dom Pacello permission to adapt the Château to his own taste and to design the gardens as he wished. He wanted them to be an experimental horticultural laboratory to see if what he had seen growing in Naples could be grown in Amboise. South-facing, built against a sixty-five foot high cliff which sheltered it from the wind, its microclimate was not dis-similar to that of the Mediterranean. And so it was, that here in Amboise, France saw its first Italian garden. Quickly dubbed The King’s Gardens, Dom Pacello created France’s first Renaissance garden for Château Gaillard, France’s first Renaissance château, for Charles, France’s first Renaissance King. They supplied Chateau Amboise with everything it needed, a sort of Royal Allotment, a very prestigious kitchen garden indeed. The original 1496 arch which led into the gardens is still there. Here Dom Pacello and his son Edme, with what must have been a very large team, planted the first orange, lemon, greengage and peach trees seen outside the Mediterranean. France saw its first tomatoes, melons, orangery, greenhouses, garden pots and boxes for horticulture. The King’s Gardener could not reproduce the sophisticated water features Charles admired in Naples but did his best. He diverted the river Amasse which ran (still runs) through the gardens to build the fountain (still there). Charles said all this Garden of Eden lacked, was Adam and Eve. Sadly, Charles, a pleasant young man, nicknamed Charles the Affable, did not live to see his Italian dream come to fruition. He died tragically, in the true sense of the word, long before his time. He was twenty-eight. Many Royals were tennis fans. Charles was no exception. On his way to see a match at Château Amboise he, as so many of us do, misjudged the height of an arch and struck his head a mighty blow on the lintel. He managed to watch the match but died hours later from a massive brain haemorrhage. Dom Pacello must have been heart broken. 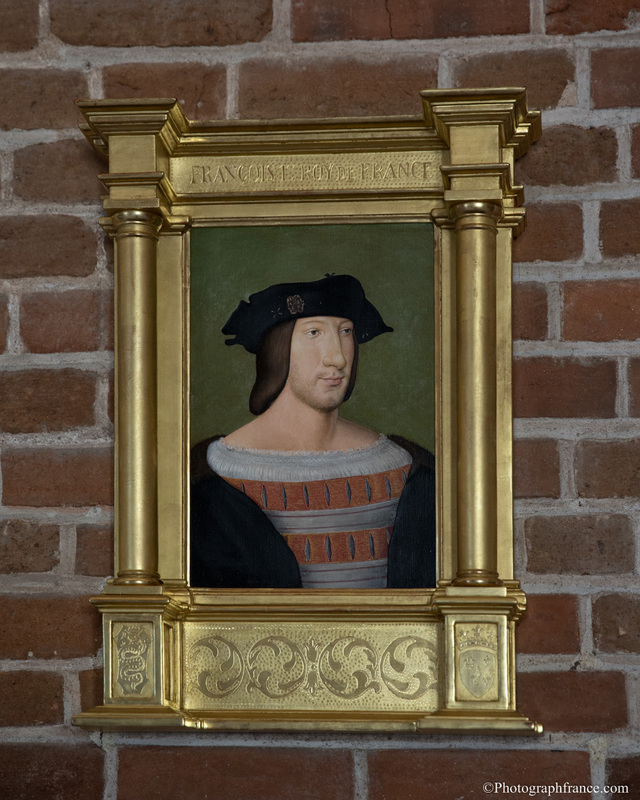 Although Charles and his wife Anne of Brittany had seven children, none survived so the throne passed to his father’s second cousin who reigned as Louis XII. He was also King of Naples from 1501 to 1504. A popular king, Louis was called Father of the People for reducing taxes and for maintaining peace. Louis, who was with Charles during his (peaceful) invasion of Italy in 1494, must have known Dom Pacello well. He was as fond of him as Charles was, so much so, he gave him Chateau Gaillard in exchange for an annual bouquet of orange blossom and put him in charge of all the royal gardens. Louis, who also married Anne of Brittany, like Charles, died without a male heir. He was succeeded by his cousin who reigned as François I.
Louis died before his gift to Dom Pacello was legally formalised so it was left to François to honour the promise. In 1515, he handed over the estate to his ‘dear and beloved Pacello’. Pacello named the greengage Reine Claude (Queen Claude) in honour of his consort. In France greengages are also called La Bonne Reine (the good Queen). It’s warming to think that when, a year later, François gave nearby Clos Lucé to Leonardo da Vinci, the old man had an Italian neighbour. Dom Pacello died in 1534. The next owner was Cardinal de Lorraine-Guise. In 1560, he held secret meetings here to thwart the Huguenots (Protestants) who planned to abduct the young king, Francois II. Also at the meetings were his brother, the Duke of Guise, the Dowager Queen Catherine de Medici, the King and his young wife Mary Queen of Scots. The next owner of any historical interest seems to have been Jean Théodore Coupier, a chemical engineer who somehow morphed into the Curator of the Louvre who retired to Château Gaillard, a place he loved. It was he who planted the splendid avenue (still there). He died in 1908 and is buried in Amboise Cemetery. Then what happened? Did Jean Théodore’s estate fall victim to Napoleonic Law? The one which says when you die (still in force) your estate is divided among all blood relatives? Did his children fight, as they do today over estates all over France, whether Château Gaillard should be sold, rented out, lived in or left to rot? Did the State which declared it a historic monument in 1963 acquire it? Whatever. It was forgotten and nature took over for over until, talk about a Labour of Love, a handsome man fought his way through the jungle and kissed it back to life. In 2010, businessman Marc Lelandais bought Château Gaillard. His Wikipedia entry says he is committed to the preservation of buildings of the Renaissance built between 1480 and 1515 in the Loire Valley. He needed to be. Three hundred artisans from fifty different trades were brought in (probably more than King Charles employed) to recreate it. Six thousand stained glass windows, made in situ, following original drawings mark its history. Charles VIII, Anne of Brittany, the orangery of Dom Pacello, Louis XII, Francis I, Francis II and Mary Stuart are all commemorated in them. After many years of (to quote Sir Winston Churchill) ‘blood, toil, tears and sweat’, the Château, for the first time in its history, is open to the public.